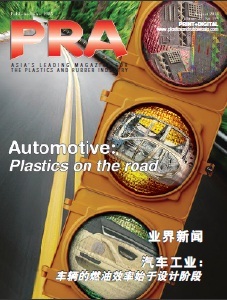 Combining the best properties of two different materials, wood and plastics, produces a one-of-a-kind composite for varied applications, says Angelica Buan in this report. Is it wood, or is it plastic? One may not be able guess the difference with wood composite plastic (WPC), which takes on the natural look of wood and the smooth finish of plastic. Aesthetically, the two materials complement each other, as well as reinforce each others good properties. But there is more than meets the eye. The composite material exhibits superior mechanical strength, low maintenance and light weight, not to mention it is sustainable, being a bioplastic material. Currently the main drivers for the growing demand of WPC are building/construction and automotive sectors, although the number of applications may increase over time. The WPC market is forecast in Grandview Research’s Global Wood Plastic Composite Market report to be worth US$9.77 billion by 2024. WPC is becoming a popular choice for decking, fencing, and moulding and siding applications. In automotive, the material is used in door panels, seat cushions, cabin linings, backrests, and dashboards. Other industries are also making use of WPC for manufacturing products such as musical instruments, shoe soles, toys, and trays. The report also mentions that being bioplastic, niche applications such as household electronics and edge protection for packaging are contributing to its demand during the forecast period. WPC is posting a huge following in the US and Europe, with Asia catching up, too. Markets and Markets, in its report, projected that the region will mark the highest growth in the WPC market by 2021, owing to the increasing demand of WPC from China, followed by Japan and India. Europe’s demand for WPC, valued over US$65 million in 2015, is surging further, Grandview Research reports. Wider acceptance in the use of the material in a wider array of applications stem from the region’s adoption of new technologies, expanding use of bio-based products and high investments in R&D. Nonetheless, there is still a need to further develop WPC for it to be useful for more applications. In the EU project called the Holistic Innovative Solutions for an Efficient Recycling and Recovery of Valuable Raw Materials from Complex Construction and Demolition Waste (HISER), wood from construction and demolition sites are being recovered and repurposed into WPC and gypsum boards, rather than ending up in incinerations. Launched early in 2015, the four-year EU project, is a consortium of 25 partners from ten countries, including Finland’s VTT Technical Research Centre and Conenor Oy, which are engaged in the development of wood waste into raw material for construction products. VTT explains that the process involves crushing the wood into particle size of about 2 mm for WPC, or reducing it further to resemble fibre if repurposed for gypsum boards. The amount of fibre used in gypsum boards is between 5 to 20%, while in the composites, the proportion of wood is around 60%. Another EU-sponsored project, the Limowood, offers solutions for bathroom and kitchen furniture manufacturing by developing a new material that is moisture and mould-resistant. This is a welcome development, especially since WPC used to be limited to applications that would keep it from moisture, even though the material is naturally decay-resistant. WPC has been found to absorb moisture and eventually decay although slower than normal wood. Furthermore, to boost market demand, the seven-partner consortium ensures that the material will be produced at a competitive price, having a good finish, thereby eliminating the need for the application of treatments that release VOCs. Furthermore, the Limowood project seeks to offer solutions that will cater to both the high and low ends of the furniture market. 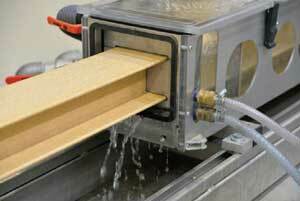 In line with the Limowood project, researchers at the Fraunhofer Institute for Wood Research, and some European partners created an ideal fully-recyclable WPC board for manufacturing indoor furniture, which is resistant to moisture, has low flammability (due to the halogen-free flame retardant additive) and formaldehyde-free. These boards are made of 60% wood particles and 40% thermoplastic material (polypropylene or polyethylene). The material components that go into the WPC are sourced from recycling streams. On the other hand, the wood component can be substituted with lignocellulose products derived from the fibrous part of plants such as hemp or cotton, or the husks of rice grains and sunflower seeds. Meanwhile, a new study from the University of Eastern Finland <strong>finds use for liquid by-products from the wood industry as additives that can be used in place of more expensive additives to enhance properties to WPC such as resistance to moisture and other elements. In the dissertation authored by Taneli Väisänen, liquid by-products or wood distillates originating from biochar production and heat treatment of wood were added to WPCs, and the effects of the additions on the composite properties were analysed. The study aims, among other things, to assess wood distillates as economical and environmental-friendly additive for WPC. At the same time, the study looks at how the method can enable commercial use of a potentially hazardous waste product. With the high costs of building houses and structures, going for lower priced materials can at times compromise safety. 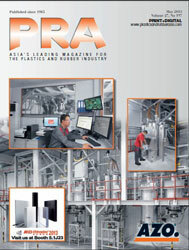 However, the combination of cost-efficiency, safety and sustainability is made possible in the WPC profiles presented by battenfeld-cincinnati, an Austrian manufacturer of extruders and complete extrusion lines, during the Vienna-held WPC conference organised by Applied Market Information (AMI). The company demonstrated its WPC line at its Austrian technical laboratory, highlighting the topical subject of utilising WPC profile production for temporary housing. A “Simply Housing” model house from UK’s TechWood International was showcased, and an H profile extruded, which is used as a connecting element in the house construction. With its line demonstration at the event, battenfeld-cincinnati presented its latest machine size of the fiberEX series, the fiberEX 93. The parallel twin-screw extruder with a 34D processing length and a maximum output of 420 kg/hour is equipped with an optimised degassing system. The specially adapted geometry of the gas outlet valve and the screw prevents leakage of melt particles from the processing chamber and ensures a high degassing performance with easy access to the degassing aperture during operation. The complete line was demonstrated in cooperation with system partners for tooling (Beologic, Belgium), material conveyance (EMDE, Germany) and the gravimetric dosing system (ConPro, Germany). A 160 x 30 mm H profile was manufactured, which is used as a connecting element in assembling a house made of WPC profiles. The formulation of the compound used, with a low bulk density of 270 g/l, consisted of 72% wood fibres and 28% PP with additives. 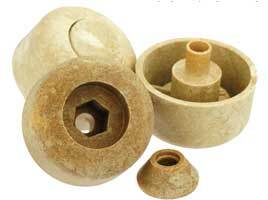 The material was processed as agglomerate that was produced in a heating/cooling-mixer system. This solution constitutes a particularly cost-efficient compounding alternative, especially since the agglomerate was fed into the extruder without using a dosing unit, simply by using the material’s hydrostatic pressure. A special advantage of the compound used in this case is its high wood content, which ensures a well-balanced indoor climate in its final application for building houses in regions of varying climatic conditions. The high wood content and because PP, which is based exclusively on hydrocarbons, is used, the profiles also fall under the Waste Wood Ordinance, which means that thermal disposal is permitted. If the WPC profiles are used to build hospitals, antibacterial additives can be blended into the agglomerate to minimise bacterial growth. A house consisting of such WPC profiles can be built for a price starting at EUR200 (or about US$226) per sq m. With the extrusion line demonstrated, units of about 60 sq m can be produced in less than one day and do not require an expert builder, owing to the easy-click system feature. Therefore, the profiles are ideally suited for use in temporary housing or for hospitals in crisis areas, and so they provide answers to many geopolitical issues, battenfeld-cincinatti said. Biobased WPC is not novel but its properties are, and companies are continuously improving properties with ongoing R&D efforts. German WPC manufacturer Jelu-Werk has been doing research on WPC and is well-experienced in producing the biocomposite, and of its ingredients, its processing and its potential applications. It offers Jeluplast, which is ideal for making indoor and outdoor furniture, consists of food-safe thermoplastic and natural fibres. The proportion of natural fibres can be set individually between 50% and 70% .To make the material more resistant to moisture, flame retardants are added. Jelu-Werk offers biocomposites based on PE, PP, thermoplastic starch (TPS), polylactides (PLA) and other plastics. The fibres used are wood fibres and cellulose fibres. Like plastic, Jeluplast can be moulded three-dimensionally and also, it offers flexibility for design. Nonetheless, it has higher rigidity and flexular strength than plastic, says its manufacturer. 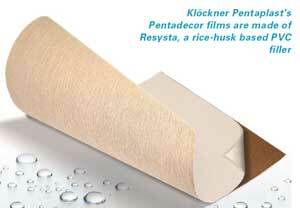 Another WPC player offering biobased solutions for indoor and outdoor applications Klöckner Pentaplast has launched its Pentadecor films made of Resysta, a rice-husk based PVC filler that is extrudable and also recyclable. The technology is owned by German firm Resysta International. Measuring less than 1 mm thick, the film can be laminated on a variety of surfaces. Developed both for indoor and outdoor applications, Pentadecor films has the beneficial properties of thermoformable natural fibre filled film that serves as a wood veneer or WPC alternative. Additives allow for water and weather resistance, flexibility and robustness. 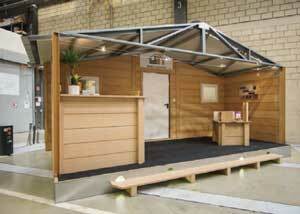 In addition, it can be sanded to a smooth wooden finish, and can be refined in a variety of colours. A direct pigment application on the surface ensures a long lasting UV-resistance. With this development in the field of natural fibre composites (NFC), the existing converting technologies (extrusion, injection moulding, compression moulding) were successfully extended to a new and patented calendering process. The film is available in reels and formats. Meanwhile, Malaysian researchers from the Universiti Teknologi MARA created a WPC material utilising Kenaf, a fibre plant that is mostly used for paper and cardboard products. The university researchers are evaluating the suitability of using pulverised kenaf, obtaining about 65% of the whole stem of the plant, as filler material. By dosing the right amount of powdered core fibre of the kenaf stem, with maleic-anhydridemodified polypropylene (MAPP), a WPC that enables better stress transfer and increased strength and stiffness can be made, say the researchers, as well as higher filler loading of 65%. Additionally, reducing the plastic content and increasing the kenaf content, while maintaining the strength, stiffness or durability of the WPC, results in greener WPC products, according to the university.